With the weather continuing to hover in the negative double digits, a steaming bowl of So-Ggori Gomtang 소꼬리곰탕 (Oxtail Soup) would hit the spot right now. Steaming thick stock made from bones that have been boiling overnight. Earthy ginseng infused in the cauldron brew. Large crispy slices of leeks. Succulent beefy and fatty oxtails. And fruity little jujubes–the prizes at the bottom of the cereal box as far as Korean soups go. I sprinkle just a bit of salt, just enough to bring the volume where I can hear it. Then a little pepper to give it more depth. Dip some fresh sweet crunchy kimchi in there, and it will cure what ails you. 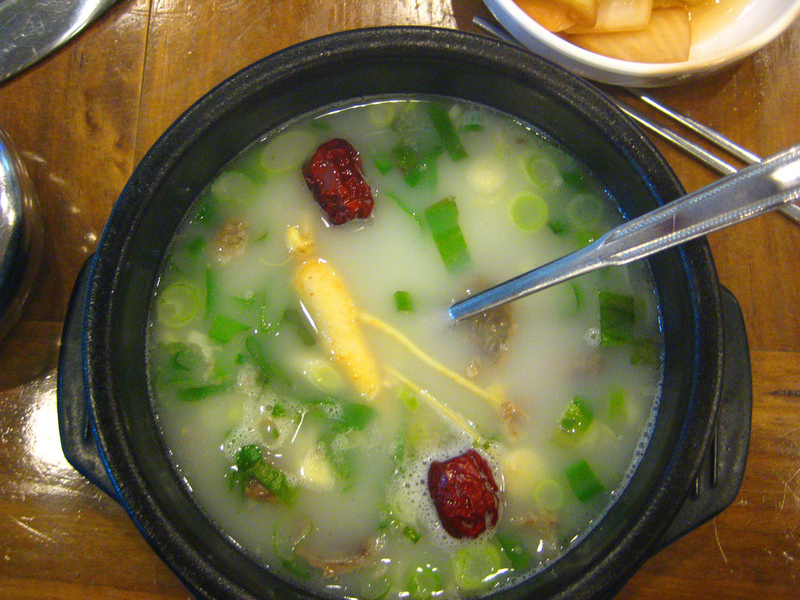 When I can’t get Ggori Gomtang, I also look for So-MeoriTang 소머리탕 (Cow Head Soup). Lots of unidentifiable beefy bits possessing interesting textures going on there. How are you beating this particularly grumpy Old Man Winter? PreviousTop 12 Dishes That We Like? 소꼬리곰탕 is good stuff! Simple but so good. I love your blog! I am korean and I love it when I see a nice korean cooking blog. This looks great! Thanks! This is the eating part, but more cooking is coming.